This critically-acclaimed adventure game was first launched for the Commodore 64 and Apple II computers in October 1987. Designed by Ron Gilbert (he also worked on the first two Monkey Island games) and Gary Winnick (he is a game artist, animator and designer), the plot revolves around Dave Miller, a teenager who needs to save his girlfriend from the clutches of a mad and evil scientist. The first video clip features a speed walkthrough of the classic 80s video game in nine minutes. 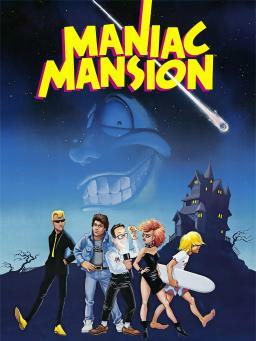 The game is designed for a single player, who must guide Dave and his two friends around a mansion occupied by the Edison family, who have become maniacs after a meteor crashed in their garden. The game uses a neat point and click interface, and before you start you must choose your team from seven different characters, with each one having different sills, strengths and weaknesses. The whole idea for the game actually came about in 1985, with the C64 being used for the development of the game which took almost two years. It was eventually ported to the Atari ST, Amiga and NES. 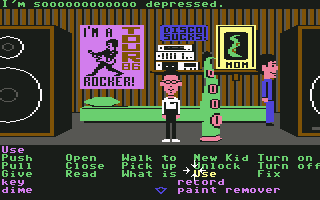 Overall, Maniac Mansion is an enthralling game that plays like an interactive movie. It's an 80s gem that set the standard for adventure games of the 90s to follow. In this clip you can view the intro to the Amiga version of the game, in which a meteor lands in the grounds of the mansion, waking up the Edison family. Who else thinks the crash of the meteor sounds more like a damp firework? However, the music is really pretty awesome and was created by Chris Grigg and David Lawrence. The music for the 1990 NES version was composed by David Warhol and George Sanger. As you would expect, this doesn't look or sound as decent as the Amiga version due to the limited capabilities of the 8-bit C64, although the explosion sound seems to have a bit more oomph! The SID soundchip's interpretation of chirping crickets is rather annoying, though!